Melbourne is loved around the world for its art, food scene, diverse culture, nightlife, shopping, and cafe culture. Known as the country’s ‘cultural capital,’ Melbourne is the place to go for museums, live theatre, festivals, and concerts. Head out of the sophisticated city centre, and you can visit the laid-back beach suburbs of Melbourne, including St Kilda and Brighton Beach. Surrounding Melbourne are some incredible day trips to experience as well. Drive along the Great Ocean Road, taste wines in the Yarra Valley, or go hiking in the Dandenong Ranges. Melbourne is an exciting destination that always has something new to discover. Booking flights and a hotel for a trip to Melbourne can get expensive. But with Webjet’s Melbourne holiday packages, you can save up to hundreds of dollars on your trip to Melbourne. Melbourne packages bundle together your flight and hotel costs to save money. These Melbourne accommodation and flight packages will also save you time. There’s no need to search the internet for the best rates. Webjet will do that for you, so you can focus on planning the fun aspects of your Melbourne holiday. Melbourne holiday packages are perfect for families or small groups who are hoping to visit the city on a budget. There are two airports serving the city of Melbourne. The main airport is Melbourne Airport (MEL), which is located 23 kilometres (14.3 miles) north of the city centre. Depending where you are flying from, you may also arrive into the regional Avalon Airport (AVV), which is located 50 kilometres (31 miles) from the city, just outside of Geelong. Each of these airports offers a SkyBus that takes passengers into the centre of Melbourne. A variety of airlines fly in and out of Melbourne Airport and Avalon Airport. The most popular airlines to take while flying domestically to Melbourne include Jetstar, Qantas, Virgin Australia, and Tigerair. Since Melbourne is one of the largest cities in Australia, it receives direct flights from airports all over the country. Direct flights are available to Melbourne from all of the capital cities as well as smaller airports, including Mildura, Alice Springs, the Sunshine Coast, and Broome. If you are travelling from Sydney, Adelaide, or the Gold Coast, you can catch a direct flight into Avalon Airport on Jetstar. Melbourne is made up of accommodation options to meet all budgets. The city has a variety of serviced apartments, hostels, high-rise hotels, and luxury offerings. For a city vibe, look for a hotel in the CBD or on the Southbank. If you are after a laid-back beachy scene, plan to stay in a suburb like St Kilda or Brighton. The Blackman is a one-of-a-kind hotel that perfectly matches the artistic atmosphere of Melbourne. Throughout the hotel, you’ll see artistic touches. Guests are even encouraged to leave their own mark by spray painting a portion of one of the hotel’s white walls. As a boutique hotel, no two rooms are exactly alike. Many rooms even have a balcony with views over the city or Albert Park. The Blackman is located on St Kilda Road, offering guests easy access into the CBD, St Kilda, and South Yarra. If you’re looking for a five-star experience in Melbourne, the Hotel Windsor is the place to go. The hotel was established in 1883 and is located within a heritage building. Over the years, the hotel has become a favourite for royals and celebrities who visit Melbourne. The Hotel Windsor is beautifully designed and feels like you are taking a step back in time to the Victorian era. There is a restaurant on-site and one of Melbourne’s top afternoon tea experiences. With a central location on Spring Street, the Hotel Windsor is within easy walking distance of the whole CBD, Carlton, Fitzroy, and the Royal Botanic Gardens. The Hotel Grand Chancellor is a budget-friendly option in the heart of the CBD. This boutique hotel combines contemporary style with a homely atmosphere. There are two restaurants on-site, but the stand-out amenity is the rooftop pool that overlooks the city. The Hotel Grand Chancellor is located in the heart of the CBD on Lonsdale Street. It is a stone’s throw from Melbourne’s theatres, restaurants, cafes, and shopping. Parliament Station and several tram lines are available near the Hotel Grand Chancellor, making it easy to explore Melbourne. Melbourne is widely considered to be the cultural capital of Australia. Throughout the city, there is lots of art to experience as well as theatre and concerts. Melbourne has a European flair to it with plenty of shopping, a great cafe culture, and some of the country’s top-rated restaurants. The Southbank is located across the Yarra River from the CBD. The Southbank has an exciting energy to it with lots of trendy restaurants and bars lining the pedestrian walk. 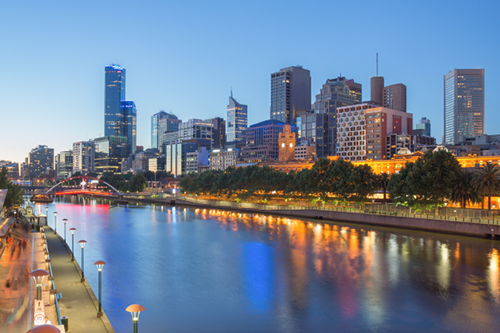 As you walk along the Southbank, you can watch street performers and take in the incredible view of Melbourne. The Southbank is also where you will find the Eureka Tower. This building is home to the highest viewing platform in the Southern Hemisphere, offering some stunning views over the city. Melbourne is home to several nice beaches. The most popular to visit is St Kilda Beach, which is easily accessible from the CBD by tram. The neighbourhood surrounding the beach has lots to do. There are shops, restaurants, bars, and the famous Luna Park amusement park. On a nice day, there is a coastal walk you could take between St Kilda and Brighton Beach–another of Melbourne’s most scenic beaches. Make sure to catch sunset from St Kilda. You can see an orange glow over the city skyline, and during this time you can see wild blue penguins at the end of the breakwater. Melbourne is known throughout Australia for its incredible street art. The city has several laneways that are dedicated to street art murals. The most famous is Hosier Lane, which is located close to Flinders Street Station. Hosier Lane has a main lane where professional murals are painted and remain up for several months. There is also a smaller practice lane, which changes almost daily. If you visit on a nice day, you can often see new street artists practicing their art in the smaller lane.